Welcome to Monday. Welcome to Cycle Chic, Russian Style. From the groovy Afisha.ru website. She bought a cheap toy bicycle by Stels, painted it and named it Joddy. She bought it for exactly one and a half thousand rubles. She uses the basket for books and all kinds of fruits and vegetables. She tried to carry her dog, Otiko, in it but he likes to run alongside. She notices that car drivers pass her winking and smiling more often than boys on the street. 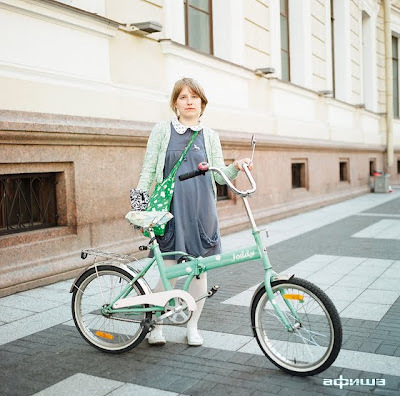 She dreams of a retro bike cruiser with a feminine frame. And yes, Cycle Chic is itching to get back to Moscow. I cycle to work on my poverty-pack hybrid in my work clothes, cruising along at a leisurely pace as the lycra brigade whizzes past with audible groans of disgust at my clear lack of cycling style. If I dare get in their way with a wobbly start at the lights, the verbal abuse would make your hair curl. I just smile politely and totter along like a happy little tortoise, invariably catching up to the lycra brigade at the many sets of lights between home and office. But for maximum effect you really have to read her whole article right here. She certainly doesn't cut any corners but she is witty and sharp about it. Interestingly, this is something we here at Cycle Chic are noticing more and more in the chatter on the internet. A kind of backlash by people who cycle in regular clothes on normal clothes against the fetish cyclists in their 'gear' who tend, in certain regions, to dominate the public image of 'cyclists'. And, in a way, shouldn't it be the general public who dominate the scene as it is them who are re-mainstreaming cycling after a break of 40 odd years? Nothing wrong with anyone who fancies joining a cycling club or anything like that. But cycling has always been a democratic pursuit and it is for the people at large - for the benefit of society. Read more about how this is just History Repeating Itself on our sister site, Copenhagenize.com. "Cycle Chic is itching to get back to Moscow." Yeah, I saw the pictures of that redhead. I've just got back to Melbourne from three weeks in Stockholm - what a stark difference - I LOVED STOCKHOLM CYCLISTS!! Yes it's true - cycling in Australia is dominated by a combination of lycra and expensive road bikes that don't see more than the 10km of road between work and home. The climate in Melbourne is fantastic for cycling (hot summers, cool winters and a drought that's been going on for 10 years so very little rain) - we just need to change a small revolution in the attitude of people here - cycling to work doesn't need to be a competition - you don't need to dress like Lance to get to work...!!! I live in Melbourne and as I rode home last night from work (plain orange riding top & black lycra pants) I did take note of several people in non-lyca clothing. I wouldn't say they were chic but its a start. I am over the advertising plastered lycra also and I hope the trend in it's decline continues. However I'm sure it will maintain it's strong hold with the week end warrior brigade. Melbourne is a long way behind Copenhagen in the Chic Stakes but bicycling is on the up here so this will create a demand for diversity in bicycles and creativity in apparel. I used to call it the commuter olypics when I live in Calgary Canada. I would ride my clunky cruiser with street clothes, getting passed by all these people on a mission to get to work as fast as they could. I never quite understood that mentallity, as I was alot more happy on my bike than in the office behind a desk. The Australian rant reminds me of this lyca cyclist video, Performance: http://www.youtube.com/watch?v=Vn29DvMITu4. Have you seen it? I would love to hear what CCC thinks of the video.